Monument erected in 1830 to mark site of various Conventicles, or field meetings. Auchengilloch is a very remote site, hence its suitability for such meetings, with little chance of being disturbed. Access is difficult, but is possible from either Logan farm, Lesmahagow parish, Lambhill farm, south of Strathaven, or from Powbrone Burn, Glengavel. 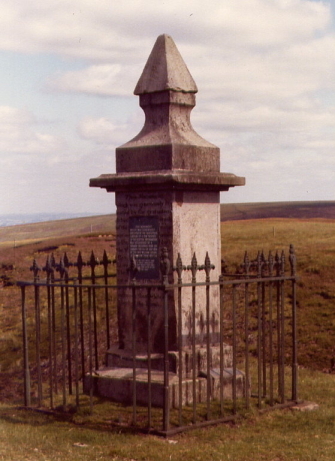 The monument was erected after a commemoration service held by Rev William Logan, Lesmahagow, on 16 July 1834. The Auchengilloch memorial was erected in 1830 to mark the site of many Conventicles. It can be accessed by a track and path from near West Cauldcoats, on the B743 (NS 683405), but requires a three mile walk from the road head. The surrounding countryside is now afforested and much of it is disfigured by wind turbines.